The Institute for World Religions is an educational and religious center dedicated to the study of the Asian and Western religious and cultural traditions. Located in the Berkeley Buddhist Monastery, the Institute benefits from proximity to an environment that is grounded in traditional Buddhism yet serves contemporary society. The Institute interprets essential aspects of Chinese culture and religions for dialogue with the other major religions of the world. Dedicated to creating a sanctuary where one can engage in conversation about theological principles, religious beliefs and spiritual practices, the Institute encourages the interfaith search for universal values in an atmosphere of cooperation and mutual respect. It aims to challenge the boundaries of our minds and avoid attachment to narrow sectarian differences. The Institute for World Religions is the direct result of ecumenical inspiration and joint planning between the Roman Catholic Cardinal Yu Bin and the Buddhist Tripitaka Master Hsüan Hua. Master Hsüan Hua was the ninth and the most recent Patriarch of the Wei Yang lineage of Chinese Chan Buddhism. He came to the United States in 1962 and established the Dharma Realm Buddhist Association which currently has more than one hundred thousand members. The Association has established schools and monasteries in Hong Kong, Taiwan, Malaysia, Singapore, Indonesia, as well as the United States and Canada. 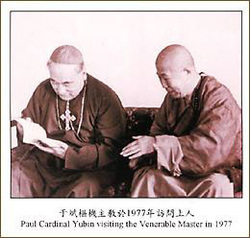 In 1976 Cardinal Yu Bin graciously consented to be the Institute's first director. In 1994 the Institute for World Religions moved to the Berkeley Buddhist Monastery. Its proximity to the University of California at Berkeley and the Graduate Theological Union, and its location in the San Francisco Bay Area have added a new dimension to the Institute's potential for rich and mutually beneficial academic, religious and cultural interchange. The Institute for World Religions offers a wide variety of programs designed to deepen self-cultivation, to enhance basic values, and to foster a genuine sense of mutual understanding among different traditions. The activities range from public lectures to public dialogue and practice sessions. Since its inception, the Institute for World Religions has sponsored an on-going forum for dialogue and programs that bring leaders of religion and spirituality into conversation with contemporary theorists of science and technology. Challenge to Spiritual Traditions: a talk by a Franciscan Priest and two Theravadan Buddhist Bhikkhus. holds a Doctorate in Turkish Studies from the University of Istanbul, Turkey, and an M.A. in Oriental Studies from the University of Belgrade, Yugoslavia. She is former President of Dharma Realm Buddhist University and currently lectures on Central Asian influences on Islam. has a Ph.D. from the University of California at Berkeley in Buddhist Studies, an M.A. in Chinese Language and Literature from the University of Washington, and an undergraduate degree from Harvard University. Professor Epstein has been with Dharma Realm Buddhist University and the Institute of World Religions since their inception. He teaches Buddhist Study and Practice. His current interests include Buddhist-Christian dialogue and applied Buddhist Ethics. holds a Ph.D. from the University of California at Berkeley in Southeast Asian Studies and an M.A. from Brandeis University. She teaches Sanskrit and translates Sutra texts from Chinese and Sanskrit. holds a Ph.D. from the Graduate Theological Union at Berkeley and has a Masters from the University of California at Berkeley in Oriental Languages. He currently lectures on the Buddhist Sutras and holds regular meditation classes. holds an M.A. from G.T.U. and a B.A. and a M.A.T. from the University of the Redlands. He is Vice President of Dharma Realm Buddhist University and currently teaches Western Philosophy and Psychology. took his Ph.D. from the University of Wisconsin-Madison. His area of interest is the process of religious acculturation, particularly in the European and American encounter with Asian religions. He was a Buddhist monk for 18 years and has studied and lectured extensively throughout Asia, Europe, the United States and Canada. The Institute for World Religions in Berkeley is affiliated with and supported by the Dharma Realm Buddhist University, a non-profit organization. It shares the religious purposes of the Dharma Realm Buddhist Association and furthers its educational goals.